3 Canadians, a Honda Civic, camping stuff, a camera, junk food, a barely functional GPS on life support named Garmina, a passport, a 5000 Km round trip, a stop at InterVarsity Press in Chicago, two tornado systems, heavy rain, a near miss with a moose, 75+ deer, nearly running out of gas, scrambling for money at Interstate highway toll booths, accidently missing one of those toll booths, too many Big Mac’s, unethically dirty gas station washrooms, the need to embrace a temporary showerless life, a well used bladder, a beard, a bunch of free books, a few bought books, camping with new and awesome American friends, new connections, a somewhat confusing Kentucky accent, David Bazan, a Margot Starbuck experience, pizza party with a bunch of authors, and a Tony Campolo handshake pretty much encapsulated the EPIC round trip to and from the 4 day Wild Goose Festival at some place called Shakori Hills in North Carolina. I heard about the Greenbelt Festival in England. A yearly gathering of likeminded folks who love Jesus. A celebration of art, social justice, music and Jesus with a great speaker line up to boot. I heard that it is an amazing experience. 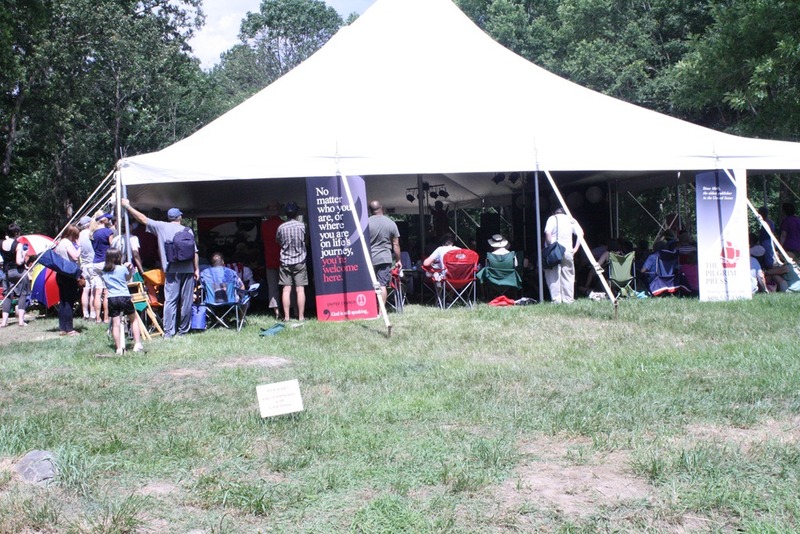 When my dear friend Jamie Arpin-Ricci texted me to see if I wanted to go to the Wild Goose Festival in North Carolina, the North American version of Greenbelt, I jumped at the chance. The experience was well worth it. The speaker line up was amazing. Tony Campolo, Richard Rohr, Ian Cron, Brian McLaren, Richard Twiss, Paul Knitter, Mark Scandrette, Sean Gladding, Jay Bakker, Phyllis Tickle and Frank Schaffer to name a few. With music by Jennifer Knapp, David Bazan, The Psalters, Derek Webb and Over the Rhein, again to name a few. An impressive collection to be sure. The opportunity to rub shoulders with some of the most influential theological minds in our era, who were and continue to be significantly foundational to my development as a Christ follower and ministering person was amazing. I saw Brian McLaren pounding back a cold one in the beer tent, Jonathan Wilson-Hargrove playing with his kids, sat around a campfire with Sean Gladding. I ate pizza with Shane Claibourn, Tom and Christine Sine, Margot Starbuck, Mark Scandrette, Jamie Arpin-Ricci and other IVP authors (thanks to the IVP team by the way, you guys are awesome!). It took me sitting there awkwardly for over an hour to build up the courage to join in any of the conversation. I saw Tony Campolo sitting alone with his wife, so I shook his hand, walked away and smiled like a dork for about 10 minutes. In the end it made them very… human. As a consequence, my engagement with their material will benefit from this experience. As far as the speakers were concerned, I had engaged much of the material by a good chunk of the presenters, so nothing was new. That kinda sucked. No life changing experiences by speakers whose material in the past had in some way or another changed my theological stance on social justice, spirituality and praxis on many issues fundamental to Jesus followers in our 2011 North American and global context. This was a weird thing, maybe because of their past impact on me, my expectations were way too high. But there was another thing. The Wild Goose Festival was a collection of left(ish) wing Christian folks. So in some of the presentations there was a ‘preaching to the choir’ feel to it. That element was a bit frustrating, particularly in the sexuality panel where the conservative slant was implicitly bashed, yet almost patronizingly identified as a potential point of view of some of the attenders. It seemed like a cheesy attempt to respect the view of the right. It felt disrespectful to some extent. One major exception to the ‘preaching to the choir’ bit was David Bazan’s set. Given his fairly recent disassociation with Christianity it was delightfully awkward seeing him perform songs from his ‘Curse Your Branches’ and ‘Strange Negotiations’ albums. After every two or three songs he would ask, in a somewhat rhetorical sense if ‘there are any questions?’ pretty funny given the doubtful and pointed critique of Christianity found in his lyric. The silence of the crowd and random shouts of “play some Pedro songs” felt like a missed opportunity for a beautiful dialogue between an artist and his audience even given the tone of his questions. The performance was raw, honest, and his talent oozed from the guitar strings into the mic and seemed to flow into a pointed lyric via his Bazan’ian’ voice. It certainly gave people food for thought as his honesty in his songs was refreshing. One of the highlights of the whole weekend for me. Though I am a huge Bazan fan. The whole ‘preaching to the choir’ dynamic bothered me for much of the 2500 km drive home. But then it hit me right around the time we almost hit a moose in northern Michigan. The Wild Goose Festival of 2011 was a celebration of a raw and beautiful message. A message of hope grounded in and inspired by faith in Jesus. People came from all over the continent gathered in the name of chasing after the Holy Spirit. It was people seeking to live, loving God and neighbour while following in the footsteps of Christ. Yes it was a collection of Jesus lovin’, left wing, social justice seekin’, artistic, like-minded individuals. But it was a wonderful place to connect with others from all over North America (and other places) striving for the same thing. Yes it was pretty groovy shaking hands with some of the more influential theologians in my life, but it was awesome to have conversations about life, ministry, spirituality, social justice and following Jesus in 2011 with regular, everyday people. It felt like a party. Wild Goose, I do not know if we will meet again. I sure hope so, cause you were awesome! Long live the Wild Goose Festival. Here are a few people who joined the party.